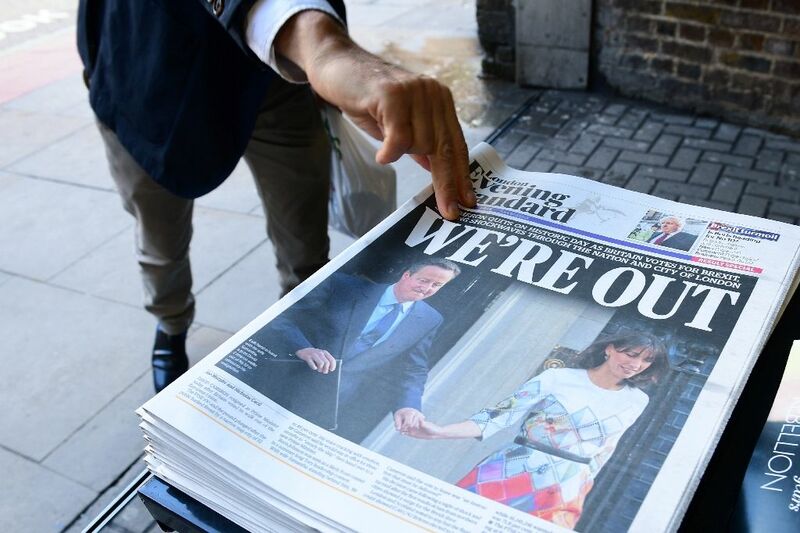 London (AFP) - Britain has voted to pull out of the European Union in a seismic blow to the bloc that triggered the resignation of Prime Minister David Cameron and sent world financial markets into freefall on Friday. The shock outcome of Thursday's historic referendum threatens to lead to the break-up of the United Kingdom after Scotland raised the prospect of another independence vote, and could have a knock-on effect on other eurosceptic member states. 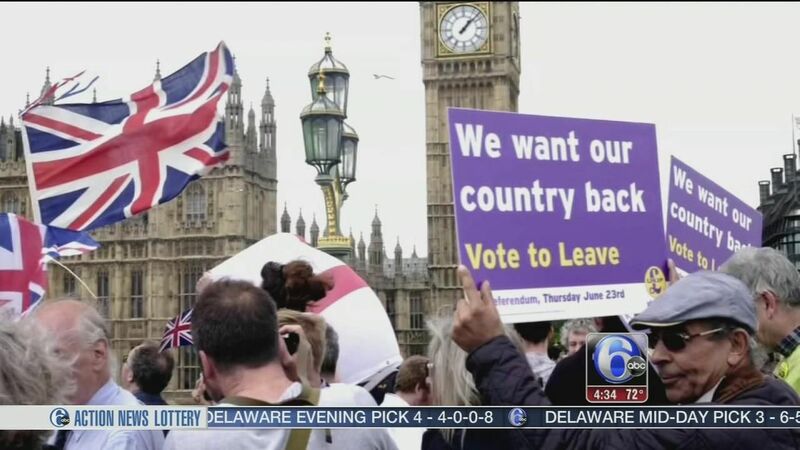 Britons, many worried by immigration and what they saw as interference in the running of their country by bureaucrats in Brussels, voted by 52 to 48 percent to abandon the bloc after four decades of often troubled membership. 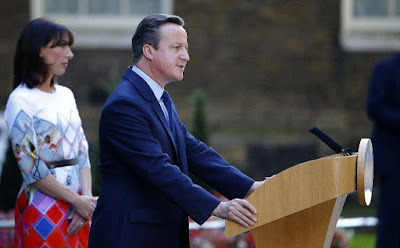 In an emotional statement outside Downing Street, Cameron said he would resign to make way for a new leader by early October after the failure of his "Remain" campaign. "I do not think it would be right for me to try to be the captain that steers our country to its next destination," he said as sterling, global stocks and oil prices plummeted. Britain will be the first country to leave the EU after decades of suspicion over its aims of ever-closer political union -- a shock victory for the anti-establishment rhetoric of the Brexit campaign that highlights growing populism across the globe. "We've done it! We've won!" anti-EU campaigners shouted at a party in London, popping open champagne bottles as "Leave" victories flowed in. "Out! Out! Out! ", they chanted as dawn broke. European Commission chief Jean-Claude Juncker denied it was the beginning of the end for the EU, already troubled by economic and migration crises and growing euroscepticism across the continent. But German Chancellor Angela Merkel called the result a "blow" to Europe while French President Francois Hollande said it was a "grave test". US President Barack Obama, who publicly threw his weight behind British EU membership during a visit to London in April, insisted the "special relationship" between the two countries was "enduring". The vote, the culmination of an often poisonous campaign, exposed deep divides across British society and what the Independent newspaper said was "the chasm between the political class and the voters". It may be some time before Britain takes the concrete steps need to extricate itself from what will become a 27-member alliance. Cameron said it should be his successor who leads the complex negotiations under Article 50 of the Lisbon Treaty which sets out a two-year time-frame to leave. Top Brexit campaigner Boris Johnson, the former mayor of London and a favourite to succeed Cameron, also said there was "no need for haste". But European chiefs made clear that the country should set the wheels in motion "as soon as possible, however painful that process may be". Leaders of the EU, born out of a determination to forge lasting peace after two world wars, will open a two-day summit on Tuesday to grapple with Britain's decision. 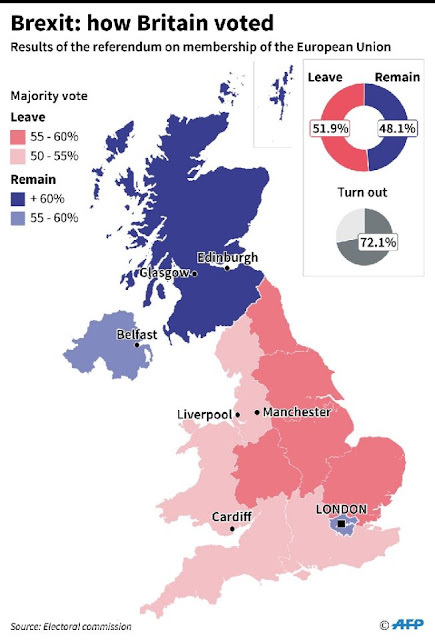 The "Leave" victory threatens to shatter the unity of the United Kingdom, with Scotland and Northern Ireland voting to remain in while England -- barring major cities like London -- and Wales supported out. Scottish First Minister Nicola Sturgeon said a second independence vote was now "highly likely" after a 2014 referendum backed staying in the UK. "The option of a second referendum must be on the table and it is on the table," she told reporters, saying it was "democratically unacceptable" for Scotland to be dragged out of the EU against its will. And while Brexit campaigners celebrated, the mood was downbeat in the City of London financial district. "I just feel so devastated that this multicultural city that I live in is going to change drastically, and the world as I know it is just not the same today," said bank worker Francesca Crimp. Top anti-EU campaigner Nigel Farage, leader of the UK Independence Party, said June 23 should "go down in our history as our independence day". Immigration and an erosion of financial security have become rallying cries for populists across Europe, just as they have for Donald Trump's campaign in the US presidential election. Trump hailed the vote as he arrived in Scotland to unveil a refurbishment of his Trump Turnberry golf course. "I think it's a great thing. I think it's a fantastic thing," he told reporters. "People want to take their country back, they want independence." The result drove sterling down 10 percent to a 31-year low of $1.3229. European stock markets dropped around eight percent at opening before recovering later while British bank shares lost a quarter of their value in morning trade. In New York, the Dow opened down 2.3 percent. "It's a madhouse in here. It has been a bloodbath. Carnage," said David Papier, head of sales trading at foreign exchange house ETX Capital in London. The Bank of England promised "all necessary steps" to secure market stability while Group of Seven countries warned the decision could have "adverse implications for economic and financial stability". British voters appeared to have to shrugged off warnings that a Brexit would create a budget hole requiring spending cuts and tax increases once they lose unfettered trade access to the EU. Thousands of jobs in the City could be transferred to cities in the EU such as Frankfurt, leading international companies have warned. Their decision will reawaken fears of a domino-effect ripple of exit votes in eurosceptic member states that could imperil the integrity of the bloc. Dutch far-right MP Geert Wilders and French National Front leader Marine Le Pen immediately called for referendums on EU membership in their own countries. Let us speak of government. We're not speaking of your government, but of any government - the way it works, how it survives, how it has survived, the way it campaigns, and how it elects leaders. It's going to change. Years ago, I told you, "When everybody can talk to everybody, there can be no secrets." Up to this point on this planet, government has counted on one thing - that the people can't easily talk to each other on a global scale. They have to get their information through government or official channels. Even mass media isn't always free enough, for it reports that which the government reports. Even a free society tends to bias itself according to the bias of the times. However, when you can have Human Beings talking to each other all at once, all over the planet without government control, it all changes, for there is open revelation of truth. Democracy itself will change and you're going to see it soon. The hold-outs, the few countries I have mentioned in the past, are doomed unless they recalibrate. They're doomed to be the same as they have been and won't be able to exist as they are now with everyone changing around them. I mentioned North Korea in the past. Give it time. Right now, the young man is under the control of his father's advisors. But when they're gone, you will see something different, should he survive. Don't judge him yet, for he is being controlled. In government, if you're entire voting base has the ability to talk to itself without restriction and comes up with opinions by itself without restriction, it behooves a politician to be aware and listen to them. This will change what politicians will do. It will change the way things work in government. Don't be surprised when some day a whole nation can vote all at once in a very unusual way. Gone will be the old systems where you used to count on horseback riders to report in from faraway places. Some of you know what I am talking about. Government will change. The systems around you, both dark and light, will change. You're going to start seeing something else, too, so let's change the subject and turn the page. … "
There's a new concept afoot, a change in Human nature. We've spoken about this before. How many of you studied European history? And in school, did your mind fill up with all of the dates you had to memorize? Who conquered whom and when? Over and over and over, every single country had their turn conquering another country. Borders moved constantly. As far back as you want to go, that's what Humans did. They separated, gathered, and conquered. But as little as 50 years ago, it all stopped. We've said this before. Fifty years ago, a seed, an idea, was planted at the end of World War II. "Let's put these European countries together," they said. "Let's even drop the borders and eventually give them one currency." Do this and they'll never war again, they predicted, for countries with common economic sources don't go to war! And that's exactly what's happened. Did it work? It's fairly fresh, but their money is threatening to take over the strength of your money, did you notice? It's worth more than yours. They still struggle to make it work and balance it. But then again, you do the same in the United States, always fine tuning the unity.